I don’t frequently stop at gurdwaras when I travel. Since my first stay, when my car broke down, I only come to the temples during specific, planned visits. Taj Kaur didn’t introduce herself to me. I had a translator who told me her name. Not all temples across California reach their peak with the Yuba City parade, which is specifically hosted by the Sri Guru Nanak Gurdwara. Other gurdwaras may take part in the procession, but they each have their own unique, community-based celebrations throughout the year. More than 50,000 — not just 5,000 — people come to the parade every year. There are over 10,000 Sikh residents in Yuba City alone. While parade organizers estimate close to 80,000 people converge along the parade route, news sources place the count from 40,000 in 2001 to 60,000 in 2006. 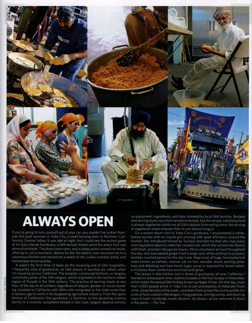 I hope that the article inspires you to visit a gurdwara in your own town and to learn more about the fascinating history and generous traditions of the Sikh. Loved your article! Glad I found your site.